Insects are the most diverse group of animals on the earth, with around 925,000 species described—more than all other animal groups combined. Sometimes it may seem that all of them live in North Texas. Listed below are some of the more common insects you will find around your home. Flea is the common name for a small wingless insect. Fleas are external parasites, living by hematophagy off the blood of mammals and birds. In most cases, fleas are just a nuisance to their hosts, but some people and some animals suffer allergic reactions to flea saliva resulting in rashes. Flea bites generally result in the formation of a slightly-raised swollen itching spot with a single puncture point at the center. Fleas can also lead to hair loss as a result of frequent scratching and biting by the animal, and can cause anemia in extreme cases. To deal with a home infestation one needs to break the life cycle of the fleas and kill off the breeding age individuals which will otherwise produce a new generation within about 10-18 days. Tic ks are second only to mosquitoes as vectors of human disease, both infectious and toxic. Hard ticks can transmit human diseases such as relapsing fever, Lyme disease, Rocky Mountain spotted fever, tularemia, equine encephalitis, Colorado tick fever, and several forms of ehrlichiosis. It is a common misconception that the tick can jump from the plant onto the host. Physical contact is the only method of transportation for ticks. They will generally drop off of the animal when full, but this may take several days. Ticks contain a structure in their mouth area that allows them to anchor themselves firmly in place while sucking blood. Pulling a tick out forcefully may squeeze contents of the tick back into the bite and often leaves the mouthpiece behind, which may result in infection. 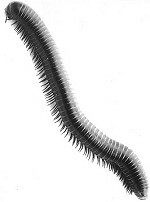 Millipedes are very elongated with cylindrical bodies that have two pairs of legs for each one of their 20 to 100 or more body segments (except for the first segment behind the head which does not have any appendages at all, and the few next which only have one pair of legs). Each segment that has two pairs of legs is a result of two single segments fused together as one. These animals are detritivores, slow and nonvenomous; unlike the somewhat similar and closely related centipedes, which can be easily distinguished by their single pair of legs for each body segment. Most millipedes eat decaying leaves and other dead plant matter, moisturizing the food with secretions and then scraping it in with the jaws. Many species also emit a somewhat poisonous liquid secretion or hydrogen cyanide gas through microscopic pores along the sides of their bodies as a secondary defense. Some of these substances are acidic and can burn the exoskeleton of ants and other insect predators, and the skin and eyes of larger predators. As far as humans are concerned, this chemical brew is fairly harmless, although it should never be eaten or applied to the eyes. Because of this, caution should be used when handling millipedes. Earwig is the common name given to an insect characterized by large membranous wings folded underneath short leathery forewings. The abdomen extends well beyond the wings, and frequently, though not always, ends in a pair of forceps-like cerci. Earwigs themselves are quite common throughout the world, often finding their way into houses, where they are usually first noticed scurrying across the floor. 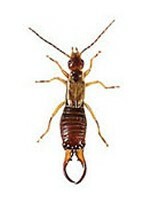 The earwig’s abdomen is flexible and muscular, and capable of both maneuvering and opening/closing the forceps. The forceps seem to be used for a variety of purposes. Their role in self-defense is familiar to every child whose first grab at a passing earwig resulted in a pinch—more surprising than painful, the forceps not being particularly strong. The Silverfish is a small, wingless insect. Its common name derives from the animal’s silvery grey colour, while the scientific name indicates the silverfish’s diet of carbohydrates such as sugar or starches. The body of a silverfish is approximately 1 in. long, excluding the antennae. The metallic sheen is due to silvery scales, which only appear after the third moult. The silverfish is widespread in human dwellings. Silverfish can often be found under refrigerators or around a well-heated toilet, if the crevices in the floor tiles are large enough. The favorite food of silverfish is any matter that contains starch or polysaccharides, such as dextrin in adhesives. These include glue, book bindings, photos, sugar, hair, dandruff, and dirt. Silverfish can also cause damage to books, tapestries, and textiles. A scorpion is an invertebrate animal with eight legs.The body of a scorpion is divided into 2 main segments: the cephalothorax (also called the prosoma) and the abdomen/opisthosoma. The claws are used primarily for prey capture but also play an important part in the scorpion mating dance. The claws are made of up of 6 segments. The claw itself consists of the upper fixed finger (tibia) and the lower movable finger (tarsus). The size of the claws is highly dependent on the species; however, a general trend is that the more venomous the scorpion, the narrower the claws, as scorpions with less potent venom use their larger pincers to subdue prey. All species of scorpion possess venom. In general, scorpion venom is described as neurotoxic in nature. It consists of a variety of small proteins as well as sodium and potassium cations, which serve to interfere with neurotransmission in the victim. Scorpion venoms are relatively harmless to humans; stings produce only local effects (such as pain, numbness or swelling). However a few scorpions can be dangerous to humans. One symptom of a scorpion sting can include numbing at the injection site, sometimes lasting for several days. Unless molested, scorpions are generally harmless and timid and make use of the sting only for the purpose of killing prey. Generally, they will run from danger or remain very still.